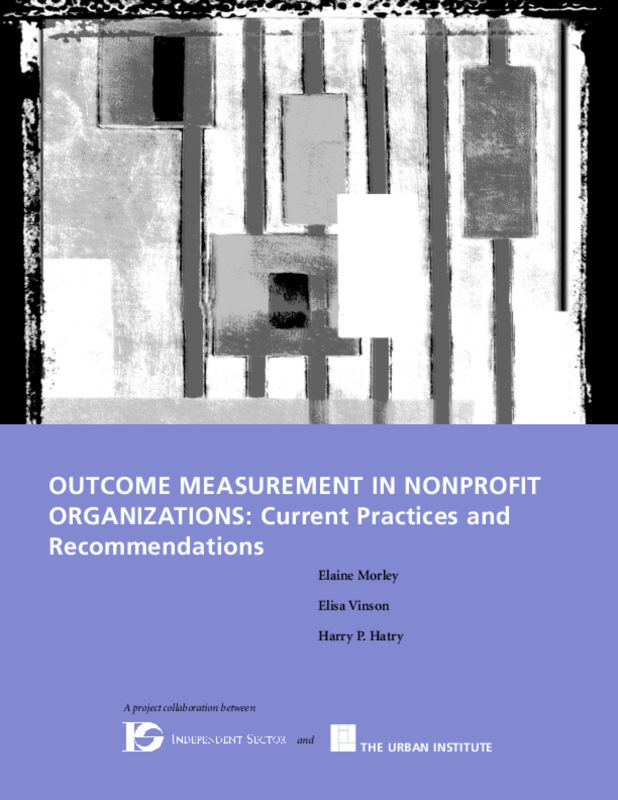 This report provides a view of the state of outcome measurement as implemented in a number of private nonprofit service organizations engaged in outcome measurement. It provides examples of procedures that some organizations have been able to implement and use for outcome measurement. For this effort, we selected a sample of organizations that responded to INDEPENDENT SECTOR's 1998 Measures Survey, specifically those that reported collecting outcome information on a regular basis. Our sample included only nonprofit organizations that provided services directly to clients (end services), not those whose primary function was to provide services to other organizations. We included organizations that provided human services (including vocational rehabilitation, employment training, youth services, housing and homeless services, and meals/nutrition programs) and health and mental health services (excluding hospitals), as well as environmental and animal protection organizations. We conducted telephone interviews with, and reviewed documents from, thirty-six organizations.